People still drink punch, right? Not like at real parties or anything, but I bet it still gets served at office parties. My last punch was at a middle school dance I helped chaperone. One of the stay at home moms (who also seemed to be a stay out of the kitchen mom) dumped a bunch of Sprite into a gigantic bowl and then floated a plastic bucket-shaped iceberg of generic rainbow sherbert in the middle. It was…not great. I don’t know what constitutes a punch exactly. I think it’s just two liquid ingredients and a big bowl. The bowl is important. I don’t think you can make punch in a pitcher. Or can you? This week’s concoction, Lemon-Grape Bubbly, was made in a pitcher BUT it was also on a page with other punches, so I guess it’s a push. It’s from the Some Like A Lot section of the book. That bothers me because it’s total preparation volume is far less than some of the other punches in the book. I think they just wanted to have rhyming sections. I can’t judge. The grape juice and Kool-Aid both assert themselves forcefully in the nosegrope. It smells quite refreshing. The grape juice provides the most flavor. It’s the backbone of the drink. 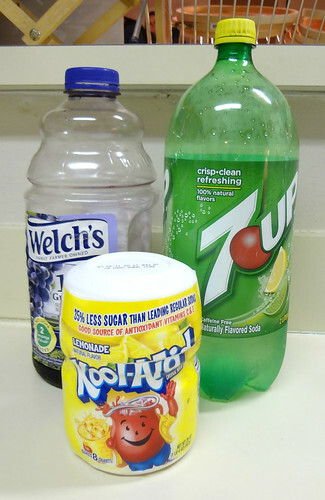 The Lemonade Kool-Aid is layered on top of that, and the 7 Up really helps to thin things out and add some sparkle. 7 Up is not nearly strong enough to compete with such strong flavor opponents. 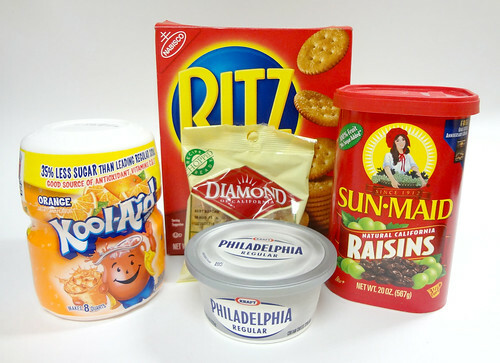 All of the flavors work very well together, but they are intense. 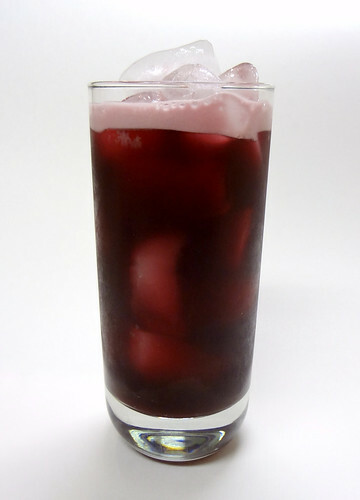 It’s a very tart and very sweet drink. 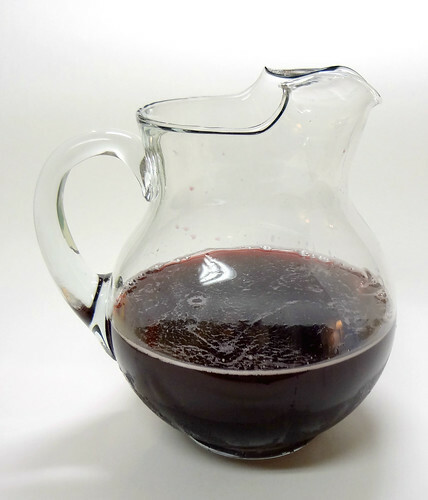 Four ounces of 7 Up and grape juice alone constitutes around 60 grams of sugar. But it’s not bad! A better attempt would be to replace the 7 Up with soda water. And a lot more than the 2 cups the recipe calls for. And a lot of ice. And maybe a lot of vodka. Thin this stuff out and it would be an ok punch. Or drink. Or whatever the rule is. Just pour it in a big bowl and go nuts. And tell that lady with the sherbert bucket to go the hell home. Nobody likes her anyway. Well everyone, Christmas is only a handful of hours away. Pretty soon you’ll be spending time opening presents, singing carols, and doing your best to tolerate those family members that you absolutely cannot stand. Perhaps this year you will be bringing your top secret mashed potatoes to dinner, or your award-winning deviled eggs, or even your patented fight-inducing egg nog. There may be pots and pans simmering on your stove at this very moment. This year, I will be bringing cranberry sauce, stuffing, and sweet potato casserole. It seems every year I add another dish to my Christmas dinner repertoire. Usually that decision comes after a revelation that I don’t like my mom’s (fill in the blank) and can’t believe I’ve been eating it for the past 30 years. I always wondered when children decide to take over the Christmas dinner responsibilities from their parents. I guess it’s when you have compiled a complete spread of recipes that exceeds the ones you’ve been eating for decades. I will be there soon, apparently. 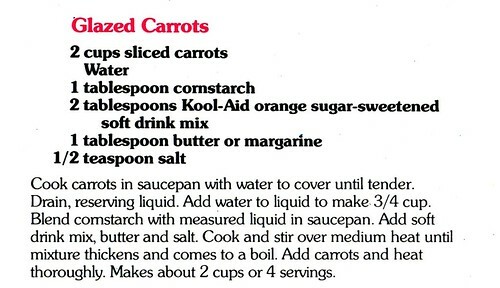 So, Kool-Aid and carrots. What to say? 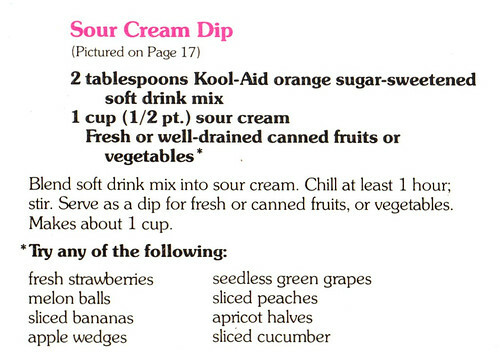 This is one of the few recipes I’ve made so far, where the Kool-Aid gets dominated by another flavor. Here the carrots are obviously the most assertive. 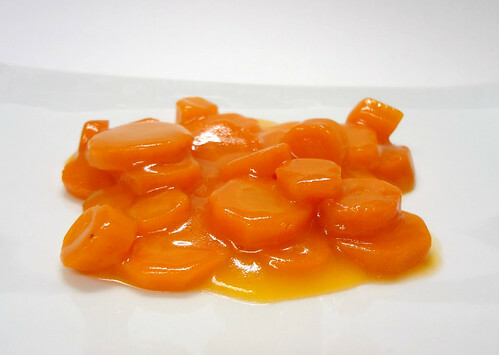 Also, the salt and butter really cut the sweetness of the Kool-Aid, so what you’re left with is a weird mélange of carrot slices floating in a salty, sweetish, orangey translucent syrup. Sounds enticing, right? I’d love to say it works, but it doesn’t. 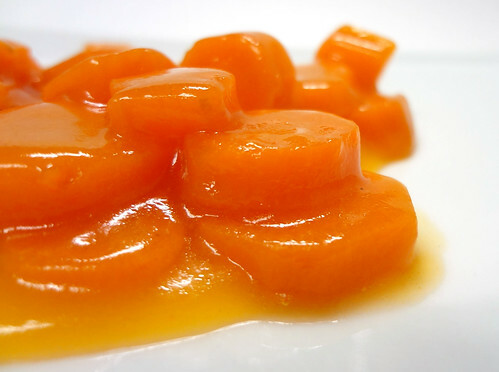 I’ve mentioned before that Orange is by far the most heinous of Kool-Aid flavors, and this dish is another reminder of that. The medicine taste of the Orange Kool-Aid comes in at the end of the chew, and therefore is the last flavor you’re left thinking about. It’s not a good flavor to end on. You’re already going to have a bunch of horrible thoughts going through your head; you don’t need to add Orange Kool-Aid rage to that. 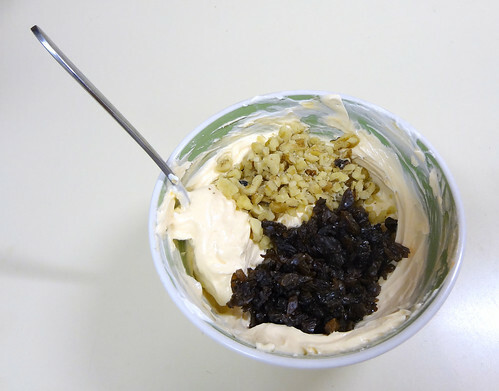 This year, if you are in need of a last second item to bring, say, if you absolutely hate preparing food and want to be sure you will not be asked to do so for future Christmases, then this is recipe for you. 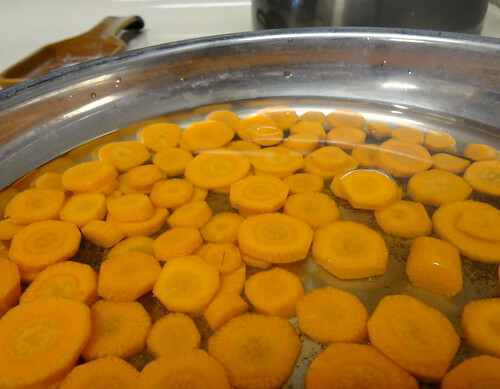 Show up with these carrots, stain the tablecloth and everyone’s insides orange, and you can be sure you’re holiday cooking days are over. Enjoy and Merry Christmas. 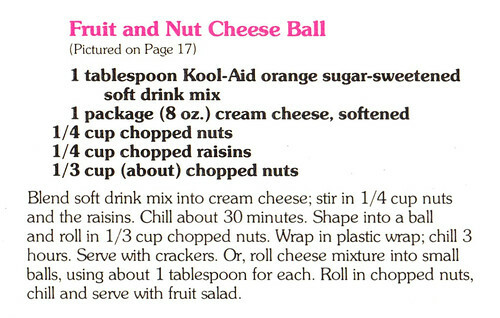 After last week’s disastrous Fruit and Nut Cheese Ball, we are reluctantly returning to the Party Ideas section of the book. 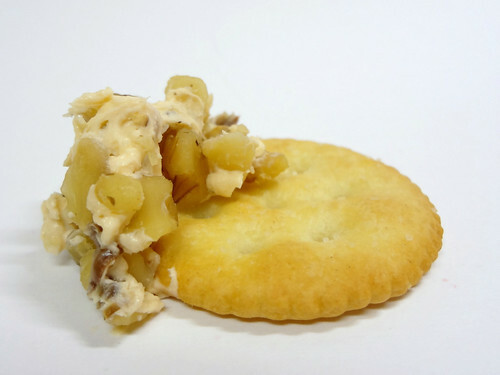 You’d be so lucky to have guests return to your party that quickly after serving them that cheesy abomination. 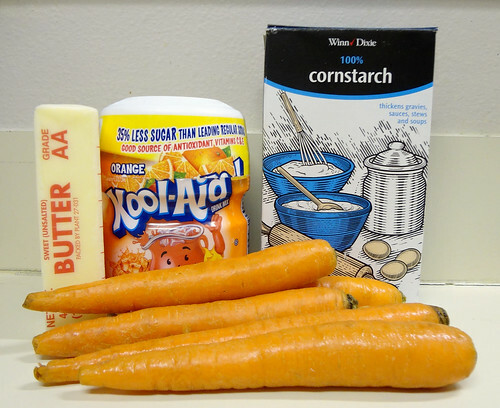 This week we are going in for a recipe that could have very well been included in the Stir-ins and Pour-ons section. I guess because it’s a dip, it gets an automatic pass to the party. It’s Sour Cream Dip. The name is surprisingly tame, I know. It’s sour cream and Orange Kool-Aid. Mixed together. That’s it. Last week I railed against Orange Kool-Aid. 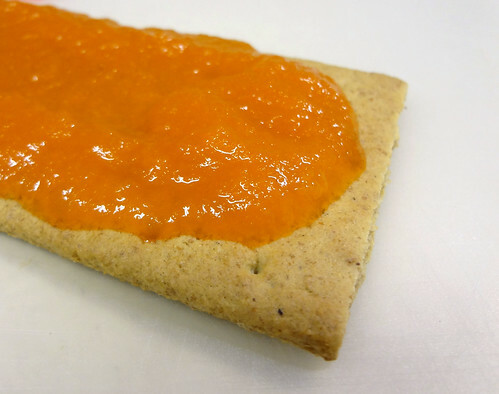 Whatever was happening on a spiritual and molecular level when that Orange Kool-Aid mixed with that cream cheese was just not good at all. They had differing agendas or ideologies or philosophies on foodballedness or something. They did not play well together, and I was more than ready to write off Orange forever. But having returned to my senses, I’m willing to entertain the idea that Orange my not be the worst Kool-Aid flavor. May not. A Twitter follower of mine recently offered up Watermelon as the worst flavor. I haven’t had Watermelon (except in candy form), but I’d be really surprised if I liked it less than Orange. Orange worked in the Hot Spiced Punch, and to a lesser degree, in the Hits-the-Spot Punch, though. So maybe it has its merits. Maybe. But I digress. 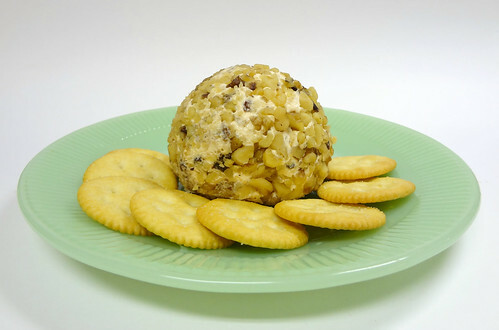 This Sour Cream Dip works much better than our cheese ball. Infinitely better, in fact. 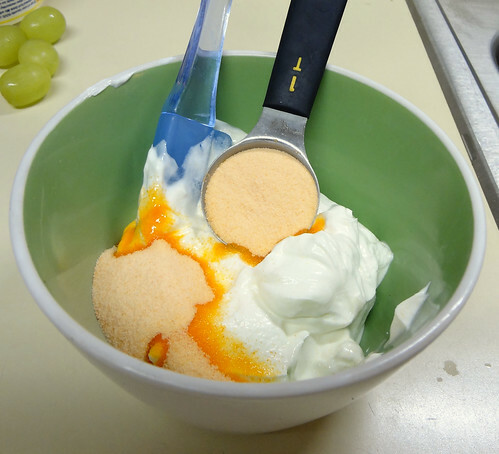 The tanginess of the sour cream works to cancel out the medicine-ness of the Orange Kool-Aid. 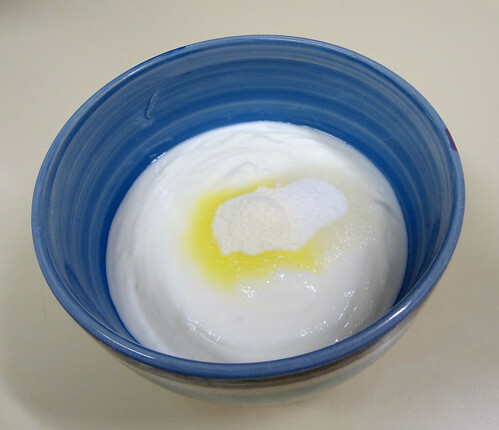 It takes that harsh sharpness and smooths it out, as sour cream is wont to do. 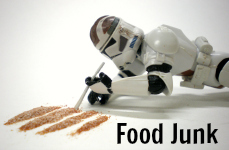 The Orange flavor gets brought back down to optimal levels for normal human consumption. 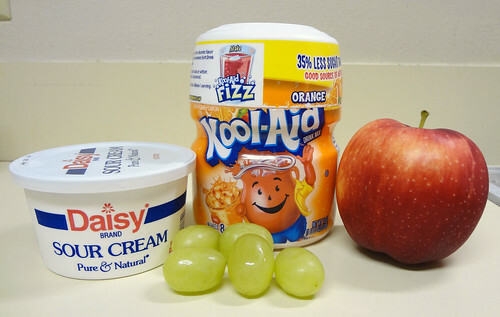 The end result is a pretty decent dip for fruits. The book recommends vegetables, too, but I dunno. I didn’t try any veggies. There’s no way they could work as well, right? 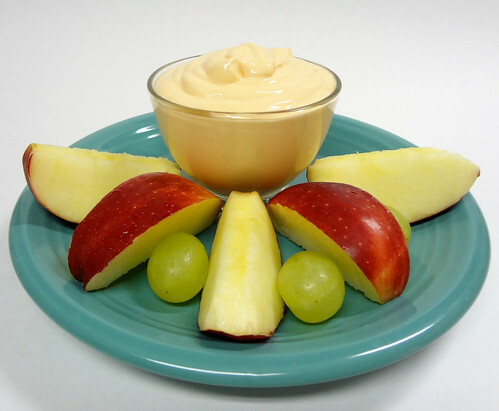 Whenever I make simple stuff like this I always wonder what other flavors could work as a dip. Mango and Pineapple come to mind. How about Sharkleberry Fin Dip?! That’s a Pinterest pin if I’ve ever seen one. But those experiments must be put off to a later day. We’ve still got 47 more recipes to go! I have to admit, this is one of the recipes in the book that gave me pause when I first saw leafed through it. I get the punches and sauces and freezes and all that. But Whipped Lemon Butter? 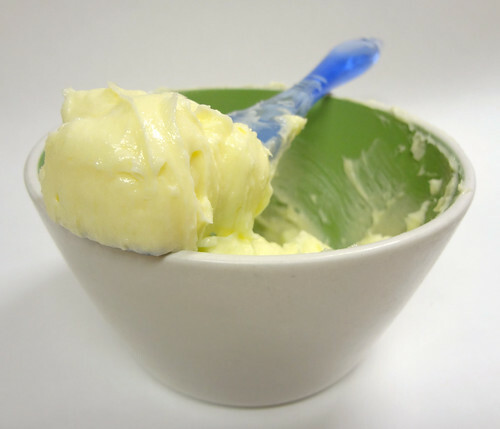 Lemon butter is literally lemon and butter! Which makes this recipe even better. You’re not really saving any time or work at all. 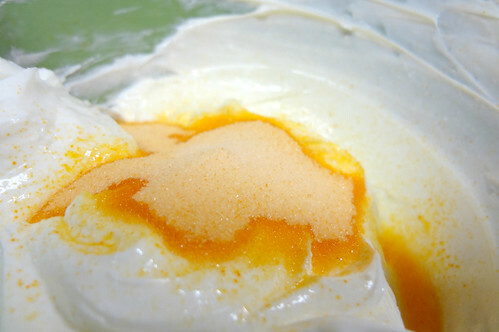 It’s just swapping one easily obtained ingredient for the next easily obtained ingredient. (Easily obtained in the seventies anyway. More on that in a second.) It’s just fantastic. I picture this being made in the Monsanto Kitchen of the Future. Now, in modern times, this recipe is more inconvenient than it appears. I could not find sugar-sweetened Lemonade anywhere! Every grocery store I went to had a bottom row full of sugar-sweetened canisters in every flavor imaginable. Except Lemonade. Where the Kool-Aid should have been, there were at least three or four other brands of lemonade. Country Time. Crystal Light. 4C. No Kool-Aid. 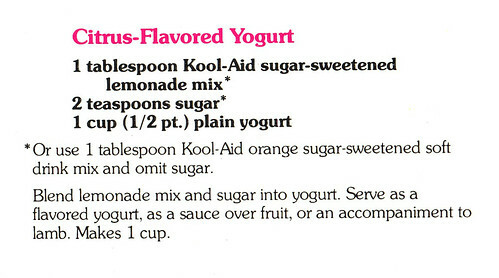 From what I can tell, Kool-Aid still makes a sugar-sweetened Lemonade. They just aren’t sending it to any stores near me. Stupid stores near me. Luckily, I found some online. For a little more than I would normally spent on yellow sugar powder. But still. I have it. The recipe calls for applying this concoction to fruit-nut bread, waffles, biscuits, or muffins. Sadly, I was fresh out of all of those things. I just can’t keep fruit-nut bread in the house. So, I went with white toast. The most basic of canvases. Also, I was a little suspicious that those items were thrown in to distract from the actual Lemon Butter. Maybe it wasn’t so good. Guys, I didn’t think I’d have to type this sentence, but this was…kinda good. Seriously. It tastes like a very bright, lemony marmalade. I know! I am as surprised as you are. 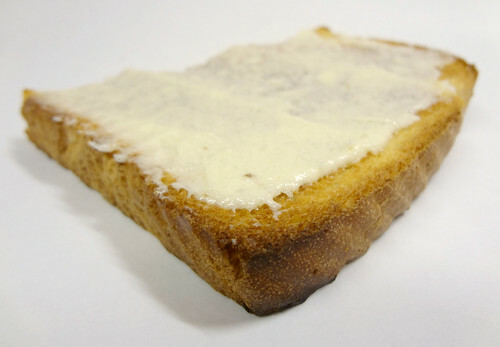 The butter on its own still has some grit from powder that didn’t dissolve completely, but when applied to toast, the grit gets lost in the rest of the crumbs. You could 100% get away with putting this out at a breakfast thing. In fact, someone do that and get back to me. I’ll bet people ask about it. In a good way. Who knew? 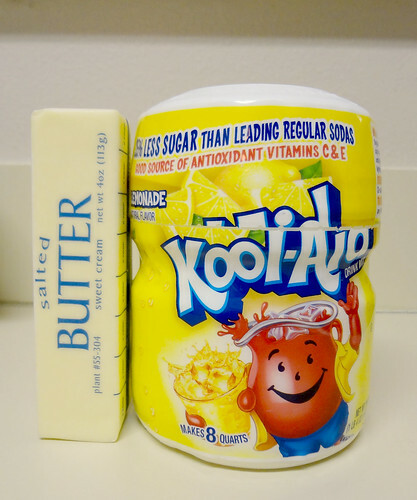 Kool-Aid and butter. Ahoy, Kool-Aid enthusiasts! 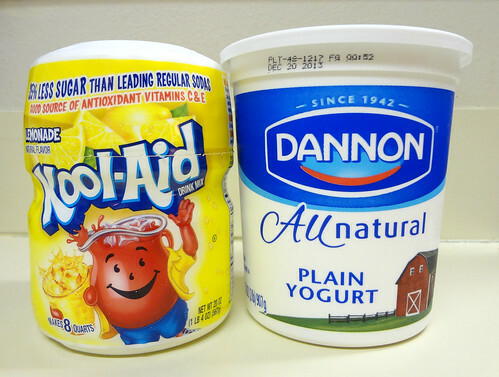 This week at the Cooking with Kool-Aid Project we dive into Kool-Aid Comes of Age to try a recipe from the Easy and Elegant Desserts section that is neither easy nor elegant. 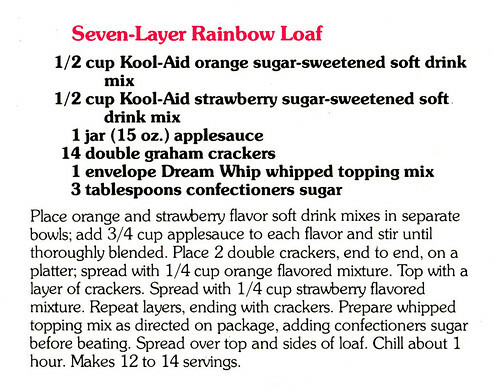 It’s Seven-Layer Rainbow Loaf, a layered treat involving Kool-Aid, applesauce, graham crackers, and Dream Whip. It’s my first loaf, guys! First off, the words elegant and loaf have never been used so close to one another before. As a rule, a loaf of any kind is not elegant. This dessert certainly proves that rule. Secondly, the authors of this book love to throw the word rainbow around even if it means you are only using one or two flavors of Kool-Aid. Layered does not equal rainbow. Thirdly, I do not know what this is. Everything I’ve made since beginning this project has been based in food reality. I’ve made drinks, pudding, and a pie. 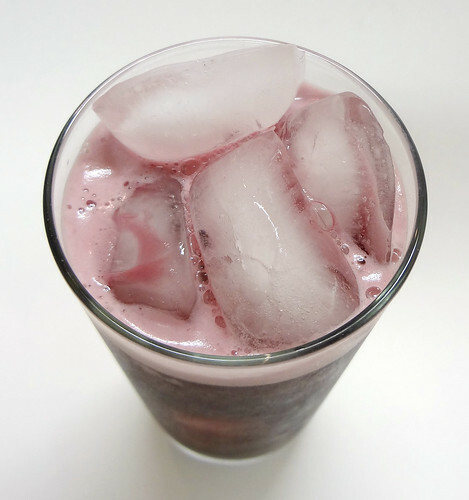 I’ve used Kool-Aid as an agent to bring color and flavor to another food like cranberry sauce. 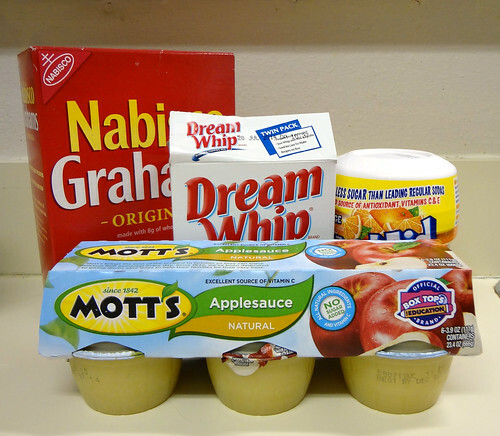 But I have never heard of the applesauce and graham cracker thing. 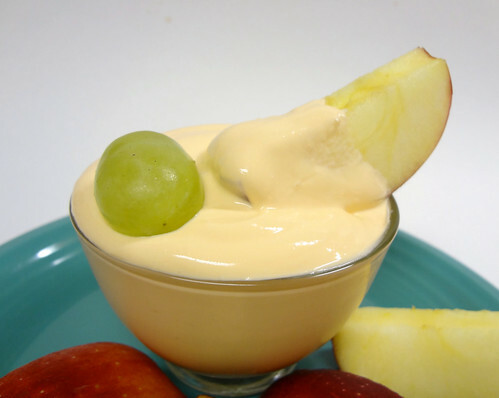 Do apples and graham crackers go together? Is this a normal combination? Have I missed out on a childhood classic? A few internet sites tell me it is a thing, so I guess I must capitulate. Still doesn’t seem all that enticing flavorwise. It also doesn’t work on a structural level. Applesauce is wet. 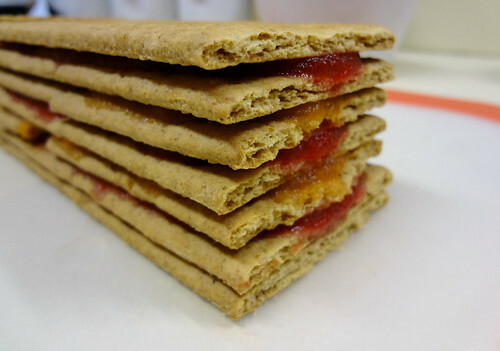 Graham crackers are porous. After a few minutes, I was left with a mound of multicolored mush covered in whipped cream substitute. I picture my loaves having a little more backbone, but what do I know? This is my first loaf after all. One thing I do love about this dessert is the fact that’s it’s covered in Dream Whip. Covering anything in whipped cream seems delightfully retro to me. No one makes desserts like this anymore. Every time I see a dessert slathered with whipped cream in a vintage cookbook, I always think it looks awesome, and hilarious. 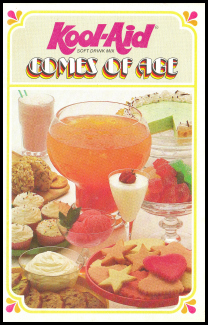 Sadly, there is not photo of this dessert in Kool-Aid Comes of Age. As with the Rainbow Ribbon Parfait, this makes me suspect that no one actually made this thing before putting it down on paper. But enough of my pontificating. How does it taste? Not terrible. 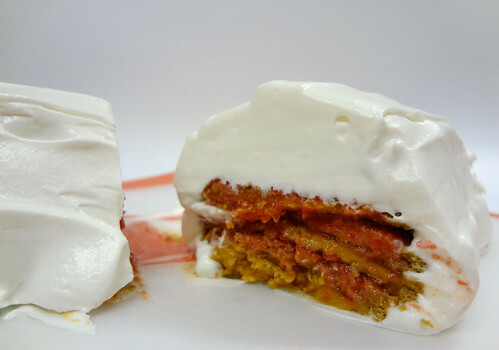 The orange Kool-Aid dominates the strawberry completely, and then joins forces with the Dream Whip. In the end it tastes a bit like an orange creamsicle. With graham crackers. All mashed into it. Like you do. Also, as the weeks progress, I am constantly surprised at how much sugar the authors of this book were able to cram into each recipe. Case in point. Not only does this recipe call for one entire cup of sugar-sweetened Kool-Aid, it also makes use of graham crackers, and applesauce, and Dream Whip. 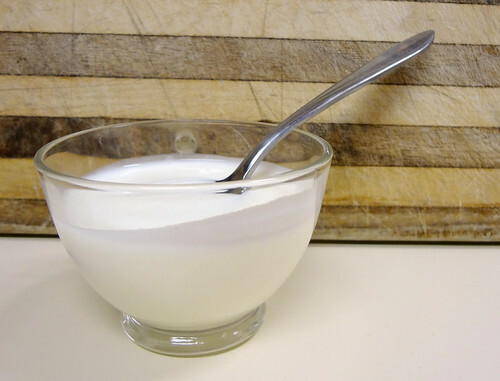 All products with pretty decent sugar contents, but then they ask that you toss in three tablespoons of confectioners’ sugar into the Dream Whip! Why?! What is happening?! 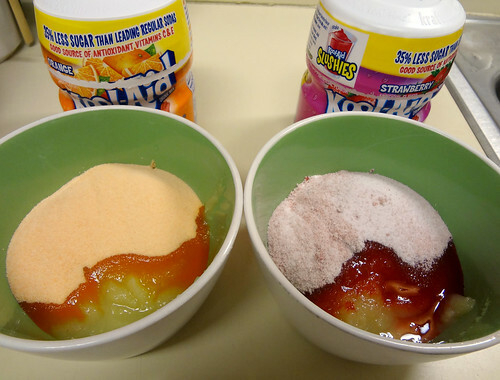 Three tablespoons of sugar?! Just because?! That’s lunacy. 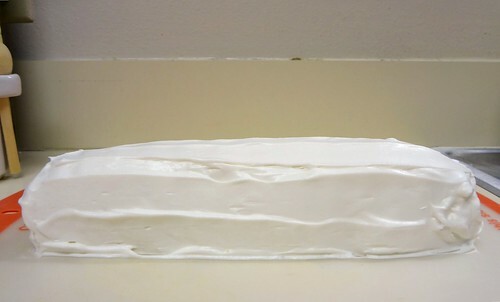 All totaled, and if my calculations are correct, one Seven-Layer Rainbow Loaf contains 277 grams of sugar! That’s 106 Hershey Kisses. Or ten Snickers bars. And I even used applesauce that had no additional sugar added! It is overwhelmingly sweet. What was happening in the 70s, you guys? I know there was white powder everywhere, but I always assumed that was cocaine. Perhaps I was incorrect. Maybe it was just sugar. Lots and lots of sugar. Just like this loaf. This elegant, elegant loaf.